Recently, you may have noticed some different attributes about your boberdoo system. This month we rolled out version 5.12, which comes with many new features that are listed in the changelog. The biggest differences, however, are highlighted below. Everyone uses passwords with many different accounts and have multiple different logins. Coincidentally, like what just happened with Facebook, not all companies keep their user's information as secure as they should. To protect our users from getting hacked, we have two factor authentication. This allows you to save your account if someone attempts to hack into it. What happens is, when you enable the two factor authentication, you register a phone number with your account. From that point forward, anytime someone tries to log into your account from a different device, they will need the passcode that will be messaged to the number you provided. This means, if someone has your password and logs into your account, they can not access it unless they have your phone as well, which is quite unlikely. IVRs are something that we have been using and perfecting for many years. We are proud to say we are quite happy with our new UI for creating and managing IVRs. For those of you who do not know, an IVR is an acronym for "interactive voice responses." These are the pre-recorded messages that we all know, where they tell you to press "one for x" and "press two for y" and so on. 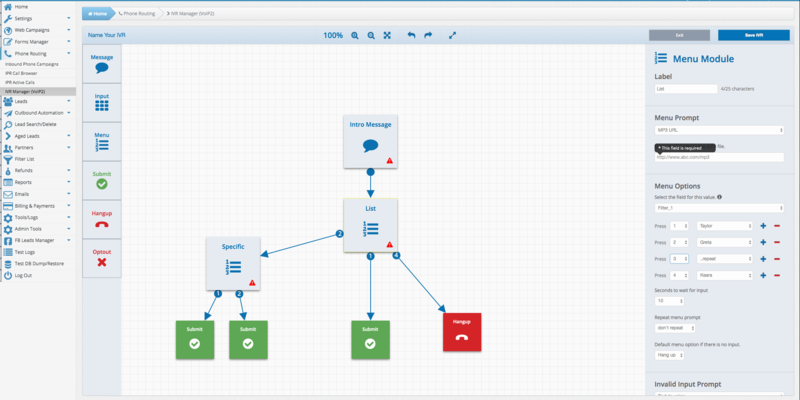 With our brand new IVR manager, the user is able to map out their IVR in a customizable, visually appealing, and also in an easily understandable way. Just drag and drop the different pieces in order, and depending on the piece, plug-in different information on the right. For messages, you can either add a pre-recorded file or type in what you want the auto-responder to say. Input, on the other hand, is for numerical values. The menu option is where the, "press one for x" comes in. The options do not stop there, though. Since boberdoo has always been a flexible software, we are always open to creating custom fields for an IVR, if something different would suit your use case. Along with the IVR manager, there is another UI that we are excited to roll out in this update, and it is on the refunds page. This one is more simplistic than a fancy new IVR manager, but none-the-less, this one makes everyone's lives so much easier when it comes to dealing with different accounts. Previously, users had to go back and forth between pages, but now everything is on a single page. This page also lists out all the buyers and can sort by lead type, request date, etc., thus, being able to see how many refunds their buyers have requested all in once place. UI was really on our minds with this update, as you can probably tell, so we also made delivery options more user-friendly, and able to add more options. To cause less confusion, we hid the plus sign if users do not want to use multiple options. Although, if a user wants to un-hide them, all they have to do is click the plus sign and add the option. If the user likes the old way better, we can always switch it back. Another cool add on to the delivery option section is the custom email sender. By default, all options are all sent by their specific SMTP, but with the custom email sender, you can send them from another email address. If your boberdoo system has been updated to version 5.12, each of these options is available in your system. However, some of these features must first be enabled by our support team to be utilized. If you do not see any of these options in your system, and would like assistance getting started with them, or if you have any other questions about this system update or its features, please open a support ticket. If you do not have a system, request a demo above to check out all these new features and many more.